The western boundary for this district begins at the Clybaun Road / Rahoon Road Junction and runs north towards Bushypark past Glenlo Abbey to the Corrib. Here it goes south and follows the course of the river to the Quincentennial Bridge at Newcastle. The line then goes west along Quincentennia Bridge (N6) to the Browne Roundabout. From here it continues along the Seamus Quirke / Rahoon Road, where it meets up and terminates at the Clybaun Road. 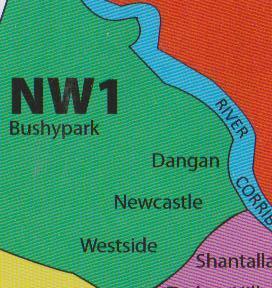 This area comprises the following main surburbs: Bushypark, Dangan, Upper Newcastle and Westside. All addresses in this zone are numbered sequentially from 100 to 199. For example, starting alphabetically, Aghnacarra in Dangan NW1 has been assigned the code: NW1 100. Next on the list: Ardilaun Road on the Thomas Hynes Road, Newcastle has been given the code NW1 101. Finally, last on the list in the NW1 zone: Westside has the code of NW1 199. All addresses in this zone are listed alphabetically and are numbered sequentially from 100 to 199. This zone is primarily industrial, technological and commercial, as opposed to residential. The main residential and most populist suburb of this zone is the Tirellan/Terryland area. The border for this zone starts at the Quincentennial Bridge (Oldcastle) and moves northeasterly via a small section of the Headford Road (Bodkin Junction to Kirwin Roundabout). From there it continues along Bothar na Treabh to Briarhill ( Lynch Junction ) from there it continues to the Monivea Road (R330) and termintes after a few kilometres. The west of this zone is entirely flanked by the River Corrib. The principal suburbs are: Menlo, Terryland, Tirellan, Castlegar and Parkmore. All addresses in this zone are listed alphabetically and are numbered sequentially from 200 to 262. Bordering NW1 and SW4 – the western border for this zone starts at Silver Strand Beach. Tracing its route in a northerly direction along the Cappagh Road, it then intersects with the Rahoon Road, and from there runs east to Bishop O’Donnell Road. The east of this zone is enclosed by Threadneedle and Bishop O’Donnell Road. The south is bordered and enclosed by GalwayBay. The main suburbs of this area are Knocknacarra, Clybaun and Kingston. 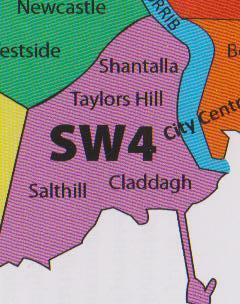 All addresses in this zone are listed alphabetically and are numbered sequentially from 300 to 464. The western and northern border of this zone starts at the bottom of Threadneedle Road and continues up Bishop O’Donnell Road / Seamus Quirke Road through the Browne Roundabout onto the R338, and terminating on the Newcastle side of the Quincentennial Bridge. The Corrib forms the border for east of this zone, and the south is flanked by Galway Bay. Main suburbs are Shantalla, Lower Newcastle and Lower Salthill. This zone also encompasses a small portion of the city centre. All addresses in this zone are listed alphabetically and are numbered sequentially from 500 to 803. Starting at the Bodkin Junction, this zone’s northern boundary follows the Headford Road and Bothar na dTreabh. At Briarhill Junction the borders follows the R339 and terminates after a few miles at Ballintemple. The southern boundary also starts at the Bodkin Junction and follows the route Sean Mulvoy / Moneenageisha Road / Dublin Road until the Martin Roundabout – where it briefly follows the R466 (Eastern Approach Road). 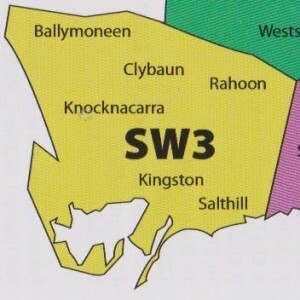 Main suburbs of this zone – Ballybane, Mervue and Doughiska. All addresses in this zone are listed alphabetically and are numbered sequentially from 820 to 968. 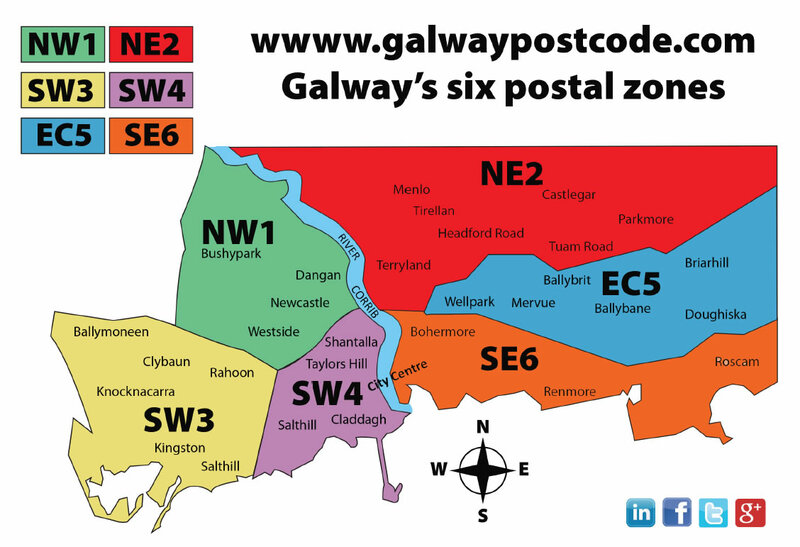 This postal district contains the majority of Galway’s city centre and the suburb of Renmore and Roscam. The northern border starts at the Quincentennial Bridge (Oldcastle) and runs in an eastwardly direction along the Sean Mulvoy Road / Moneenageisha Road / Dublin Road to the Martin Roundabout where it follows the R466 (Eastern Approach Road) for about 2 kilometers. 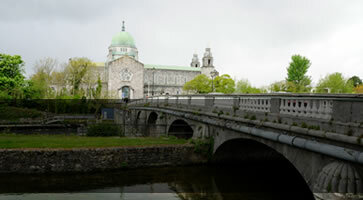 The west of this zone is bordered by the Corrib – from the Long Walk to Quincentennial Bridge. The southern section is entirely flanked by Galway Bay. Main suburbs: Bohermore, Renmore and Roscam. All addresses in this zone are listed alphabetically and are numbered sequentially from 1000 to 1241.